Visit our website for more news and information! 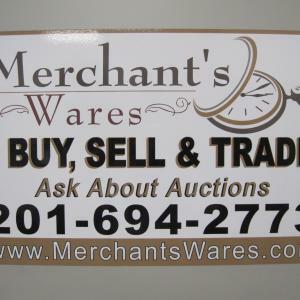 Merchant's Wares provides a number of venues for selling! We manage Estate and Moving Sales, sell online and through our two retail locations. We sell online through Proxibid and can ship all over the US! Follow us on Facebook, we post all sorts of news, pictures and updates! We also have an assortment of unusual, unique and different items for sale and for live auction in our Ringwood, NJ location. in Lewisburg, Pennsylvania at Silvermoon Antiques and Consignment Barn. I welcome all questions and am willing to work with you to ensure you are happy with our services. Please contact me if you are looking to sell some of the types of items you see here, or know of someone who is. I also do cleanouts, and will tailor our transaction to your needs. From cleaning out junk, to valuable pieces, I’m always interested in seeing what you’ve got! Recently opened in July 2016, this is our northern NJ showroom and Auction Gallery. This place is huge, with 30,000 square feet of antiques, collectibles, tools, useful used, and much more! Lots of great dealers, wide aisles, and lots of parking! We also sell items for our auction consignors at Howard Rainey’s Auctions, in Salladasburg, PA 17740. We have a number of markets to make your selling experience as simple or quick as needed, and we work with you, to help match your needs. You may arrange for pickup of items from any of our auctions or sales in any of our locations (and sometimes in between!) Just call or contact us before the end of the sale to confirm details. Open House - Box Lot Sale! This company has posted a total of 117 estate sales. Only the most recent 50 sales are shown.